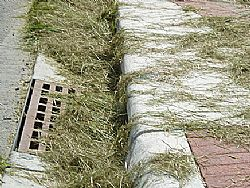 SARASOTA COUNTY – With the rainy season fast approaching, residents and business owners are being reminded to keep lawn clippings out of local roadways. Doing so will help to ensure that area waterways and aquatic life are protected, and prevent the possibility of costly damages to important infrastructure. While it may seem harmless, yard debris can easily be transported to stormwater pipes and ditches, which can lead to flooding and costly maintenance, costs which could also be passed on to homeowners. Plus, residents and business owners can be subjected to fines. Yard debris also poses an environmental threat, because as it decomposes, nutrients such as nitrogen and phosphorus are released causing algae blooms, which can block sunlight and lead to fish kills and unsightly waterways. Keeping the grass clippings on the lawn will not only protect the environment and local infrastructure, but also provide beneficial nutrients to the soil, and your lawn, according to Wilma Holley, a Florida Friendly Landscaping Specialist for the UF/IFAS Extension in Sarasota County. "It's important to remember that keeping yard debris off the roadways is a benefit to everyone," Holley said. "Sarasota County's waterways are of vital importance, and protecting one of our most precious assets should be a top priority." If you would like to report a violation, or if you have questions about grass clippings and leaves being left in the roadway, please call the Sarasota County Contact Center at 941-861-5000 or visit www.scgov.net.